Lisa’s been to Cars Land, and lived to tell the tale! Special bonus: Listen for the confused, uncomfortable noise that Jennifer makes as she tries to hide her disgust that Cars Land made Lisa want to watch Cars. And don’t worry, Lisa’s not really gonna watch Cars. Shout out to Jeff W. for recording this week’s intro! 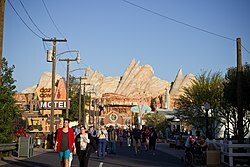 This entry was posted in Cars Land, Disney Parks, Disney's California Adventure by Jennifer. Bookmark the permalink.